City of Surrey App is LIVE! 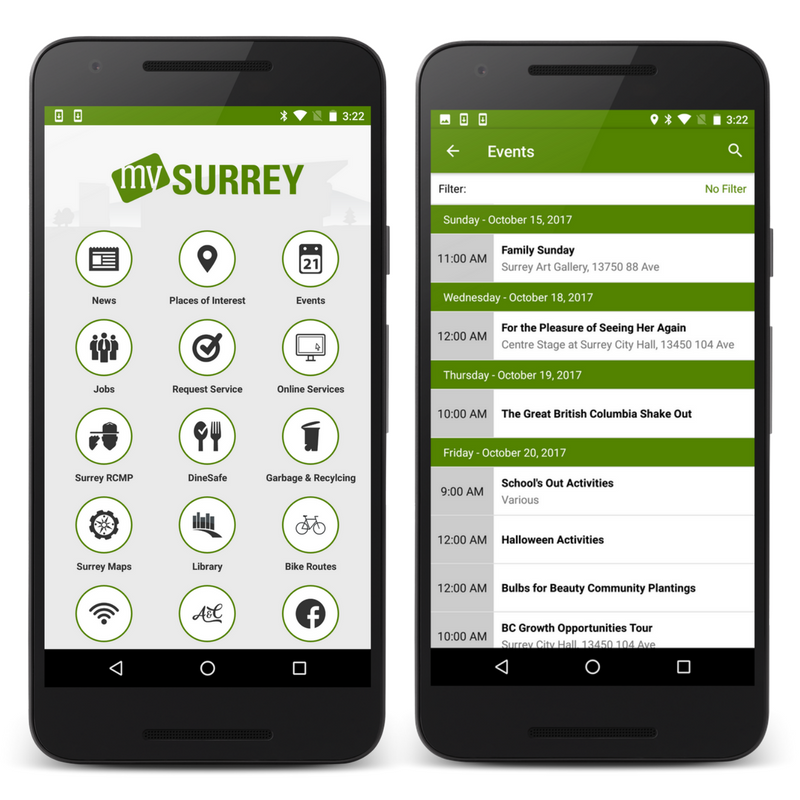 14 Oranges, in partnership with the City of Surrey, has officially re-launched the MySurrey mobile app available for both iPhone and Android. Effective last week, the all-in-one citizen engagement app can be downloaded from both the App Store and Google Play Store for free. Surrey leverages our powerful Info Grove software as a communication platform to keep citizens informed about local interests. After the departure of their prior developer, the City of Surrey was left stranded with an unusable mobile app. 14 Oranges answered the call, working with the City of Surrey, allowing for Surrey residents to now have their old app back in their pocket. In just a few weeks all of the old data and information was transferred to a new app using 14 Oranges’ Info Grove platform. Info Grove is a great option to transform old legacy applications to more modern native technology, thus providing the best user experience. 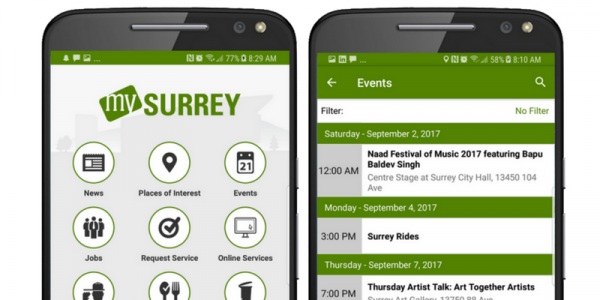 Using the MySurrey app, citizens are able to access all of Surrey’s important information and related content from a centralized platform. Residents can use the app to locate bike routes and wifi hotspots, search job opportunities and events, contact city personnel, and more. Also, MySurrey will link residents to the City of Surrey RCMP, Dinesafe locations, garbage/recycling schedules, and provide the ability to request maintenance. As Surrey continues to grow and expand, the app will be updated to keep providing the most relevant and important information. The City of Surrey was able to accomplish this fast transition by utilizing 14 Oranges’ SaaS (Software as a Service) offering called “Info Grove.” Info Grove is a self-managed mobile app service that is being increasingly used by governments and associations across North America. Governments can use the apps for more than just general communication, it can be a great resource to drive political engagement and report problems. If you prefer a podcast, click here to listen to a short clip of our CEO, Sylvain Marcotte, discussing mobile apps for the City of Surrey. Info Grove acts as an outbound communication platform. Primarily used by member-based organizations, the self-managed app software allows administrators and other non-technical staff to change and add content without going back to 14 Oranges. Staff at the City of Surrey will now be able to add new events, news stories, and send push notifications with ease using the Info Grove backend management system. Info Grove follows similar guidelines to WordPress and 14 Oranges ensures the platform is as user-friendly as possible. Click here to learn more about Info Grove mobile apps.